Athletics, specifically is not only about Usain Bolt or Mo Farah. At the 2017 IAAF World Championships, the 16th edition is being held from 4 to 13 August 2017 in London, United Kingdom, there was curiosity – on the track were Fred Kerley, Steven Gardiner, Baboloki Thebe, Demish Gaye, Wayde Van Niekerk, A Haroun, Nathon Allen – count it again – yes, only 7 and the 8th a famous runner was missing in the 400M event. Botswana is a landlocked country located in Southern Africa. The citizens refer to themselves as Batswana. Botswana is topographically flat, with up to 70 percent of its territory being the Kalahari Desert. It is bordered by South Africa, Namibia, Zimbabwe and Zambia. Its capital and largest city, is Gaborone. Botswana is a member of the African Union, the Southern African Development Community, the Commonwealth of Nations, and the United Nations. It is a country badly afflicted by AIDS. Now Bolt has quit, the sport is desperate to replace him. Everyone is in a rush to coronate the new king. Van Niekerk has been on the international circuit for four years. In 2014 he won the silver at the Commonwealth Games in 44.68sec, in 2015 he won the World Championships in 43.48sec and in 2016 he won the Olympics in a world record 43.03sec. The to get the coveted Gold, could scarcely have been more convoluted, but the London World Championships finally will have the showdown everyone wanted - Wayde van Niekerk versus Isaac Makwala in the 200m final. To describe events of recent days as strange would be a gross understatement. The ‘Makwala Saga’ has seen more twists and turns than a pretzel and it continued apace on Wednesday. 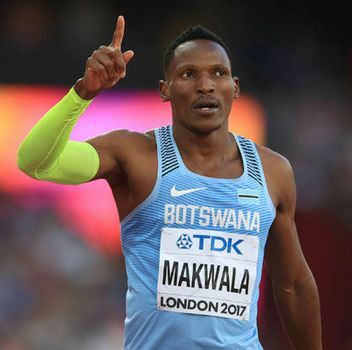 It was early afternoon when the International Association of Athletics Federations made the unexpected announcement that all was not lost for Makwala’s medal aspirations. While England and other Nations when they tour India make a big hue and cry about Delhi belly – UK is not free and Norovirus is one of the most common stomach bugs in the UK. Symptoms include diarrhoea and vomiting and it is known as a 'winter bug' but can be caught at any time during the year. It is passed from person to person and is highly contagious, often causing hospital wards to shut. Doctors recommend sufferers drink plenty of water, take paracetamol and stay in bed. Medics also recommend washing hands thoroughly with soap and using disinfectant on surfaces to prevent the spread of the sickness. BBC presenter Gabby Logan has been accused of 'bullying' an athletics medical chief following a heated on-air interview about the withdrawal of Botswana runner Isaac Makwala from the World Championships. Outraged viewers branded Logan 'ignorant' and said she 'should be ashamed' after she 'interrogated' Pam Venning, Head of Medical Services at the IAAF, during coverage of the event from the Queen Elizabeth Olympic Park in London last night. Dr Venning was forced to repeatedly defend medics' decision to recommend Makwala, 30, be withdrawn from the competition after he displayed symptoms of norovirus, which has already struck down at least 30 other athletes. The recommendation led to Makwala, who is a national hero in his country, being denied entry to the stadium on Tuesday night shortly before he had hoped to compete in the 400m finals, despite him saying he felt 'ready to run'. The good news is that ~ less than 24 hours after the Botswana athlete had been refused entry into the London Stadium when attempting to line up for the 400m final, he was handed a lifeline in the form of a 200m solo time trial. Regardless of whether he had indeed suffered from the norovirus outbreak that has affected more than 40 athletes and officials at these championships - he maintains that he never did have the disease - his 48-hour quarantine period was over and the IAAF were only too happy to go into damage limitation mode as they looked to end the bad publicity that the episode had brought. So it was that two days after he had vomited on arrival for the 200m heats and been banned from running, Makwala was cheered to the rafters as he lined up all alone in the thundering rain on Wednesday evening. The task was simple: run a time of 20.53 seconds to improve on the slowest qualifier from the heats and he would advance through to the semi-finals. Coming to London as the fastest man in the world this year, it appeared a simple enough assignment in spite of the conditions and so it proved as he clocked 20.20sec. Then came the bonus action. 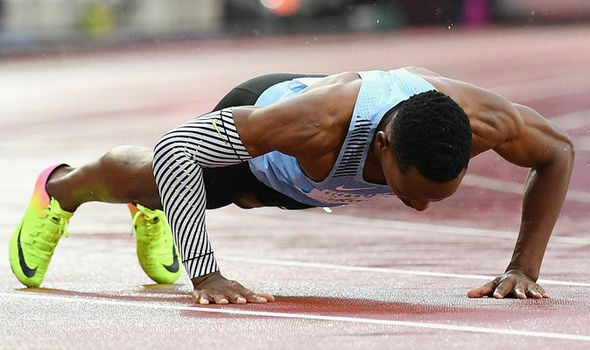 Keen to prove a point to those who had stripped him of his 400m dream, Makwala dropped immediately to the track on crossing the finish line, completed a rapid-fire set of push-ups and stood to attention with a salute. Ushered away by a member of the IAAF communications team, Makwala then had little more than two hours to prepare himself for the next round, for which he was given the tricky task of the tight inside lane - one of two lanes not sheltered from the rain. After everything he had endured over the previous few days those trivialities mattered not a jot as he later admitted he was "running with anger". The smile as he crossed the line was colossal. Thank you for sharing details about both of your blogs. I have gone through some of your articles on temples and some of your articles on your other websites. Your articles are informative.